This is the one to watch. This is a ******* wasp! Regular readers will know how the Ranger has an uneasy respect for waspkind. At this time of the year there aren’t many around yet and it’s easy to forget our yellowjacketed friends, but don’t be fooled: they are busy getting ready for the summer. 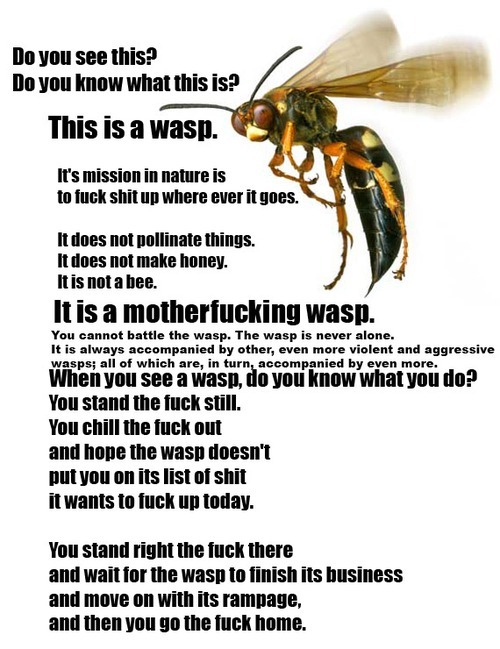 I was entertained to find, whilst reading Imgur’s ‘Best pictures of 2010’ one wasp-related graphic which I decided not to use earlier this year as, well, it’s a bit profane. In fact, very profane. But I enjoyed it so much I thought that you could probably make the decision for yourself. So if you don’t like rude words, don’t click through. Posted on 3rd June, 2014 3rd June, 2014 Author The Virtual RangerCategories The Ranger's surfing highlightsTags imgur, wasps3 Comments on This is a ******* wasp! 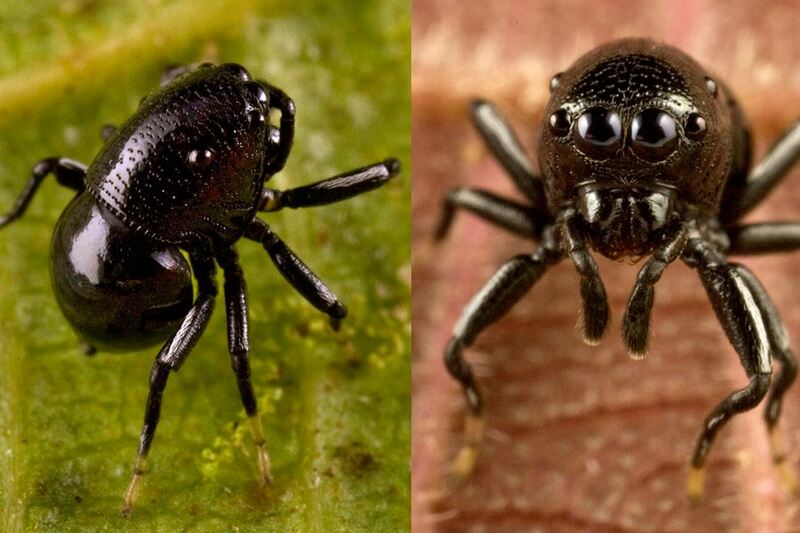 Jumping spiders are known to imitate ants – and some of these clever mimics can be found in the UK. But this is the first time I’ve ever seen a beetle-mimic. The species is Coccorchestes ferreus which is mostly found in New Guinea, and very rarely on mainland Australia. Nice legs! The world’s leggiest animal is rediscovered. Last seen in 1928, the colobognathÂ millipede Illacme plenipes is thought to have more legs than any other animal on earth – oneÂ female was found with 750 legs, while the males are thought to have a maximum of 562. Despite its legginess the species is actually quite small, even relative to other millipedes. Females grow to just over an inch long; males are slightly smaller.Â NowÂ scientistsÂ from the University of Arizona have rediscovered this elusive beast, and here’s a video of it. Continue reading Nice legs! The world’s leggiest animal is rediscovered. Posted on 15th November, 2012 Author The Virtual RangerCategories The Ranger's surfing highlights, VideosTags invertebrates, massive animals, millipedesLeave a comment on Nice legs! The world’s leggiest animal is rediscovered.